Today’s (June 24) spectacular launch of the most powerful version of the venerable Atlas V rocket from the sunshine state completes the orbital deployment of a constellation of advanced tactical communications satellites for the U.S. Navy. A United Launch Alliance (ULA) Atlas V rocket successfully launched the massive MUOS-5 satellite into clear blue skies from Space Launch Complex-41 on Cape Canaveral Air Force Station, Florida, at 10:30 a.m. EDT – on its way to a geosynchronous orbit location approximately 22,000 miles (37,586 km) above the Earth. The Mobile User Objective System-5 (MUOS-5) satellite is the last in a five-satellite constellation that will provide military forces with significantly improved and assured communications worldwide. Lockheed Martin is the prime contractor for the MUOS system. As launch time neared the weather odds improved to 100% GO and Atlas rumbled off the pad for on time launch that took place at the opening of a 44 minute window. The launch was broadcast live on a ULA webcast. The 206 foot tall Atlas rocket roared to space on an expanding plume of smoke and crackling fire from the first stage liquid and solid fueled engines generating over 2.5 million pounds of liftoff thrust. Their contribution complete, all 5 solid rocket motors were jettisoned with seconds about 2 minutes after liftoff as the liquid fueled first stage continued firing. The spent first stage separated about 5 minutes after liftoff, as the Centaur second stage fires up for the first of three times over almost three hours to deliver the hefty payload to orbit. “We are honored to deliver the final satellite in the MUOS constellation for the U.S. Navy,” said Laura Maginnis, ULA vice president, Custom Services, in a statement. This is the fifth satellite in the MUOS series and will provide military users up to 16 times more communications capability over existing systems, including simultaneous voice, video and data, leveraging 3G mobile communications technology. With MUOS-5 in orbit the system’s constellation is completed. 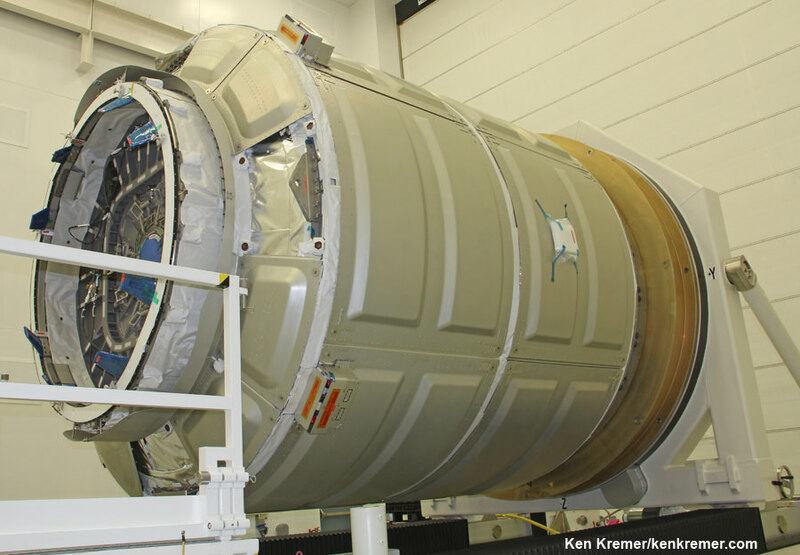 MUOS-5 will serve as an on orbit spare. It provides the MUOS network with near-global coverage. Communications coverage for military forces now extends further toward the North and South poles than ever before, according to Lockheed Martin officials. The prior MUOS-4 satellite was launched on Sept. 2, 2015 – as I reported here. 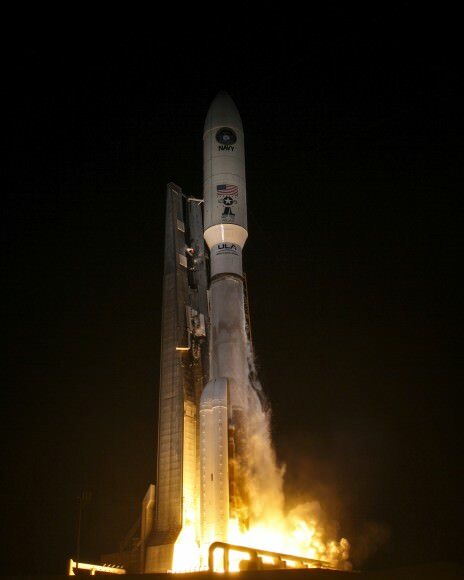 The 20 story tall Atlas V launched in its most powerful 551 configuration and performed flawlessly. The vehicle includes a 5-meter diameter payload fairing and five solid rocket boosters that augment the first stage. The Atlas booster for this mission was powered by the RD AMROSS RD-180 engine and the Centaur upper stage was powered by the Aerojet Rocketdyne RL10C-1 engine. And the rocket needed all that thrust because the huge MUOS-5 was among the heftiest payloads ever lofted by an Atlas V booster, weighing in at some 15,000 pounds. The Centaur upper stage was fired a total of three times. For this mission the payload fairing was outfitted with an upgraded and advanced acoustic system to beet shield the satellite from the intense vibrations during the launch sequence. This Atlas launch had been delayed several months to rectify a shortfall in the first stage thrust that occurred during the prior mission launching the Orbital ATK OA-6 cargo freighter in March 2016 on a contract mission for NASA to resupply the International Space Station (ISS). The launch comes just two weeks after blastoff of the ULA Delta IV Heavy, the worlds most powerful rocket, on a mission to deliver a top secret spy satellite to orbit – as I witnessed and reported on here. “I am so proud of the team for all their hard work and commitment to 100 percent mission success,” Maginnis added. The launch was supported by the 45th Space Wing. “Today’s successful launch is the culmination of the 45th Space Wing, Space and Missile Systems Center, Navy and ULA’s close partnership and dedicated teamwork,” said Brig. Gen. Wayne Monteith, 45th Space Wing commander and mission Launch Decision Authority, in a statement. Watch this exciting launch highlights video reel from ULA – including deployment of MUOS-5! The MUOS-5 launch marked the 63rd Atlas V mission since the vehicle’s inaugural launch in August 2002. To date seven flights have launched in the 551 configuration. These include all four prior MUOS missions as well as NASA’s New Horizons mission to Pluto and the Juno mission to Jupiter. Watch this compilation of dramatic launch videos from Jeff Seibert. The next Atlas V launch is slated for July 28 with the NROL-61 mission for the National Reconnaissance Office (NRO). CAPE CANAVERAL AIR FORCE STATION, FL – Today’s (Sept. 2) stunningly successful launch of the US Navy’s revolutionary MUOS-4 tactical communications satellite atop a mighty Atlas V rocket produced an unexpectedly exotic skyshow beyond compare for lucky spectators all around the Florida Space Coast, as it thundered off a Cape Canaveral launch pad and simultaneously generated house and bone rattling vibrations. Seasoned and long time launch enthusiasts have rarely if ever never seen anything like this morning’s spectacular predawn launch of the Mobile User Objective System-4 (MUOS-4) satellite for the US Navy at 6:18 a.m. EDT aboard a United Launch Alliance Atlas V rocket from Cape Canaveral Air Force Station, Florida. As the rocket arced over eastwards above the Atlantic Ocean the huge vapor trail turned utterly exotic – producing a whitish oval glow that appeared out of nowhere, and looked to me like a moving and living creature as it moved downwards and forwards. Although the rocket appeared to head towards the Earth’s horizon it was actually being propelled to orbit by the most powerful variant of the Atlas V rocket. The alien looking trail was fortuitously highlighted by glint from the sun that may have been enhanced by a slight delay of some 19 minutes from the originally planned launch time of 5:59 a.m. EDT as the launch team worked to resolve a technical issue. Local residents in the Titusville, Fl, area and surroundings told me that their houses and windows shook this morning from the powerful roar and thunderous sound waves pulsing away from the Atlas V rocket. Sleeping children were awoken, close to school time anyway! And another gentleman said he felt it inside the shower with running water – having misunderstood the launch time! The MUOS-4 launch by United Launch Alliance had also been postponed by 48 hours from Monday morning Aug. 31 due to threatening weather expected from Tropical Storm Erika which most likely would have obliterated today’s uniquely beautiful experience! The Lockheed Martin-built MUOS-4 satellite was successfully orbited by the Atlas V and is already talking from space to the satellite control team at the Naval Spacecraft Operations Control facility in Naval Base Ventura County, Point Mugu, Calif.
MUOS-4 will enable near-global coverage for a new secure military communications network offering enhanced capabilities for mobile forces. “Today’s successful launch will enable the MUOS constellation to reach global coverage,” said Jim Sponnick, ULA vice president, Atlas and Delta Programs. MUOS is a next-generation narrowband tactical satellite communications system designed to significantly improve ground communications for U.S. forces on the move. This is the fourth satellite in the MUOS series and will provide military users up to 16 times more communications capability over existing systems, including simultaneous voice, video and data, leveraging 3G mobile communications technology. With MUOS-4 in orbit the system’s initial constellation is completed. It provides the MUOS network with near-global coverage. Communications coverage for military forces now extends further toward the North and South poles than ever before, according to Lockheed Martin officials. The unmanned Atlas V expendable rocket launched in its mightiest configuration known as the Atlas V 551 with five solid rocket boosters augmenting the first stage. And the rocket needed all that thrust because the huge MUOS-4 was among the heftiest payloads ever lofted by an Atlas V booster, weighing in at some 15,000 pounds. Ken is onsite for launch coverage from Cape Canaveral Air Force Station and the Kennedy Space Center. CAPE CANAVERAL AIR FORCE STATION, FL – Blastoff of an advanced communications satellite for the US Navy is set for early Wednesday morning, Sept. 2, using the most powerful variant of the United Launch Alliance (ULA) Atlas V rocket – following a 48 hour postponement due to terrible weather expected from Tropical Storm Erika, which pounded islands in the Caribbean causing destruction and over 20 deaths. The threat of strong winds and heavy rains forced Florida Gov. Rick Scott to declare a state of emergency in every county in Florida last Friday that was still in effect as rains doused central Florida on Monday. ULA decided against rolling the Atlas V rocket out to the seaside pad on Saturday in support of the then planned launch of the Multi-User Objective System satellite on Aug. 31. Liftoff of the Multi-User Objective System-4 (MUOS-4) satellite for the US Navy is now slated for 5:59 a.m. EDT from Space Launch Complex-41 at Cape Canaveral Air Force Station in Florida, and will be broadcast live. The launch window extends for 44 minutes from 5:59-6:43 a.m. EDT and the weather outlook is now promising. US Air Force weather forecasters currently predict a 70% chance of favorable weather conditions for “GO” at launch time on Wednesday morning. The unmanned Atlas V expendable rocket will launch in its mightiest configuration known as the Atlas V 551 with five solid rocket boosters augmenting the first stage. Therefore the predawn liftoff is expected to be absolutely spectacular, resonating with a thunderous roar rising on a huge smoke trail that will light up the darkened skies all around the Florida Space Coast for spectators here and far beyond. The ULA webcast starts about 20 minutes before launch. The launch time moves up 4 minutes in the event of a 24 hour delay. The weather prognosis stands at 70 percent “GO”. This is the fourth and last satellite in the MUOS series and will provide military users 10 times more communications capability over existing systems, including simultaneous voice, video and data, leveraging 3G mobile communications technology. MUOS-3 launched earlier this year. The launch countdown will begin at 11:09 p.m. EDT on Tuesday night, Sept. 1, followed by fueling of the Atlas V rocket. A busy year of 13 space launches by rocket provider United Launch Alliance (ULA) in 2015 begins with a pair of blastoffs for the US Navy and NASA tonight and next week, emanating from both the US East and West Coasts. The hefty manifest of 13 liftoffs in 2015 comes hot on the heels of ULA’s banner year in 2014 whereby they completed every one of the firm’s 14 planned launches in 2014 with a 100% success rate. “What ULA has accomplished in 2014, in support of our customers’ missions, is nothing short of remarkable,” said ULA CEO Tory Bruno. ULA’s stable of launchers includes the Delta II, Delta IV and the Atlas V. They are in direct competition with the Falcon 9 rocket from SpaceX founded by billionaire Elon Musk. And ULA’s 2015 launch calendar begins tonight with a milestone launch for the US Navy that also marks the 200th launch overall of the venerable Atlas-Centaur rocket that has a renowned history dating back some 52 years to 1962 with multiple variations. And tonight’s blastoff of the Multi-User Objective System (MUOS-3) satellite for the US Navy involves using the most powerful variant of the rocket, known as the Atlas V 551. Liftoff of MUOS-3 is set for 7:43 p.m. EDT from Space Launch Complex-41 at Cape Canaveral Air Force Station in Florida. The launch window extends for 44 minutes and the weather outlook is very favorable. It will be carried live on a ULA webcast. The second ULA launch of 2015 comes just over 1 week later on January 29, lofting NASA’s SMAP Earth observation satellite on a Delta II rocket from Vandenberg Air Force Base in California. MUOS is a next-generation narrowband tactical satellite communications system designed to significantly improve ground communications for U.S. forces on the move, according to ULA. This is the third satellite in the MUOS series and will provide military users 10 times more communications capability over existing systems, including simultaneous voice, video and data, leveraging 3G mobile communications technology. ULA’s second launch in 2015 thunders aloft from the US West Coast with NASA’s Soil Moisture Active Passive mission (SMAP). It is the first US Earth-observing satellite designed to collect global observations of surface soil moisture. ULA began operations in December 2006 with the merger of the expendable launch vehicle operations of Boeing and Lockheed Martin. ULA’s Delta IV Heavy is currently the world’s most powerful rocket and flawlessly launched NASA’s Orion capsule on Dec. 5, 2014 on its highly successful uncrewed maiden test flight on the EFT-1 mission. Overall, the 14-mission launch manifest in 2014 included 9 national security space missions, 3 space exploration missions, including NASA’s Orion EFT-1 and 2 commercial missions. Beyond MUOS-3 and SMAP, the launch manifest on tap for 2015 also includes additional NASA science satellites, an ISS commercial cargo resupply mission as well as more GPS satellites for military and civilian uses and top secret national security launches using the Delta II, Delta IV and the Atlas V boosters. NASA’s Magnetospheric Multiscale Mission (MMS) to study Earth’s magnetic reconnection is scheduled for launch on an Atlas V 421 booster on March 12 from Cape Canaveral. See my up close visit with MMS and NASA Administrator Charles Bolden at NASA Goddard Space Flight Center detailed in my story – here. In March, June and September the GPS 2F-9, 2F-10 and 2F-11 navigation satellites will launch on Delta IV and Atlas V rockets from Cape Canaveral. Two top secret NRO satellites are set to launch on a Delta IV and Atlas in April and August from Vandenberg. An Air Force Orbital Test Vehicle (OTV) space plane may launch as soon as May atop an Atlas V from Cape Canaveral. The MUOS-4 liftoff is set for August on another Atlas from the Cape. The Morelos 3 communications satellite for the Mexican Ministry of Communications and Transportation is due to launch in October from the Cape. In November, the Atlas V will be pressed into service for the first time to launch the Orbital Sciences Cygnus Orb-4 cargo vehicle to the International Space Station (ISS) as a replacement rocket for the Orbital Sciences Antares rocket which is grounded following its catastrophic Oct. 28 explosion on the Orb-3 mission from NASA Wallops. The Orb-4 launch also marks ULA’s first launch to the ISS. It may be followed by another Cygnus launch atop an Atlas V in 2016 as Orbital works to bring the Antares back into service. In another major milestone down the road, the Atlas V is being man rated since it was chosen to launch the Boeing CST-100 space taxi which NASA selected as one of two new commercial crew vehicles to launch US astronauts to the ISS as soon as 2017.